This doesn’t include things like the Avengers: Infinity War footage that apparently wowed the Hall H audience, though you can find bootlegs of it online if you’re into grainy, tilted cell phone video. Black Panther, Blade Runner 2049, and others fall into the same category, though there are ubiquitous recaps of the footage out there for those of you who like to read about things you can’t see. 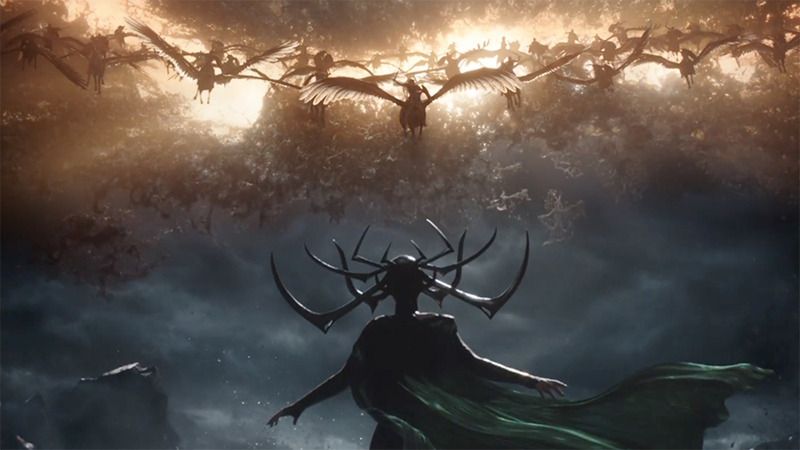 So, Thor: Ragnarok continues to look like the best Marvel movie in a long time. I’m so into the Day-Glo, candy-colored, deep-space fantasy road trip vibe with Thor and Hulk. For all Marvel’s talk about taking steps to ensure their films are less homogenous and allowing filmmakers to leave their individual stamp, none looks to take that to heart like this film. We’ll have to see if Taika Waititi’s film plays out like that, but it certainly has a different vibe than anything they’ve done thus far. I worried that Stranger Things season one was one of those situations where the filmmakers had their chance, weren’t sure they’d get another, and put every idea they had into the episodes. That made for a hell of a launch, but would they have anything left in the tank? From this trailer, it certainly appears they do. I can’t wait for Halloween. Reading Ernest Cline’s Ready Player One, I tried to envision how it could be adapted, and drew a blank. But if anyone can pull it off, it has to be Steven Spielberg. I’m still not 100% sold after watching this trailer, but it’s intriguing for sure. My biggest worry is that it’s going to look like a videogame, and this footage doesn’t do much to ease that fear. But we’ll see. I had no idea what to expect from Westworld, but it turned out incredible. And I have no idea what to expect from season two, but I can’t wait. It looks like things are taking a head-first dive into craziness. It doesn’t arrive until 2018, but it gives us something to look forward to. Okay, Star Trek: Discovery, I’m in. It looks big and cinematic and like it captures what makes the series so special and beloved. Justice League still looks like Justice League, and how much mileage you get out of that depends on how much you dig that sweet Zach Snyder style. Though both The Flash (Ezra Miller) and Aquaman (Jason Momoa) are pretty awesome. I do hold out hope that Warner/DC have learned a bit from the success of Wonder Woman. This footage doesn’t look quite as dour as Batman v Superman. They’ve found space for levity, optimism, and scenes that aren’t just a rainbow of greys. I hope they find their footing, because I would love nothing more than to see an incredible Justice League movie.